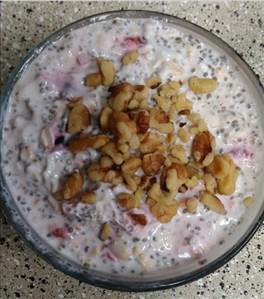 Overnight no-cook chia oatmeal with fruit and nuts. Heat it up or eat it cold. Note: you may choose to add the walnuts in the morning for an added crunch. 44 members have added this recipe to their cookbook. Great breakfast and snack yogurt. Creates a visually stunning, delicious and healthy breakfast. There are 545 calories in 1 serving of Overnight Chia Oatmeal. Calorie break-down: 30% fat, 54% carbs, 16% protein.